This analysis cautions against the rush to adopt ‘hate crime’ legislation as a panacea to racist violence in Ireland. In particular, it addresses the way in which the contemporary fetishisation of ‘hate’ trivialises oppression. The term ‘hate crime’ itself hints at some of this. Its resemblance to the Orwellian notions of ‘sexcrime’ and ‘thoughtcrime’ conveys accurately the sense of totalitarian moralising it transmits. Moreover, this wider social construction of ‘hate’ has diluted an original focus on racist hatred and concocted a post-modern caricature of ‘evil’. In her song Shake it Off Taylor Swift exemplifies this infantilisation of both hate and the reaction to it. ‘Hate’ is inanely reframed as something that it is possible to ‘shake off’ – both for the hated and – in other circumstances – for the hater. It is a ‘bad thing’ but only in the sense that it belongs to an ever-lengthening sequence of negatives in contemporary popular culture. In other words, ‘hate’ is reduced – alongside ‘playing’, ‘heartbreaking’ and ‘faking’– to the status of a meme on the discontents of contemporary white America. We might observe that the Trump intervention played to the same sense of discontent – albeit to an even more offensive tune. This is not of course to simply dismiss the ever-widening circle of hate-discourse. We should stand in solidarity with people who feel they are hated because they have a particular body shape or belong to a particular youth subculture or have a particular colour of hair. But we should not conflate these experiences with racism. This is equally true of other systems of subordination. We need to be clear: racism is not the same as homophobia or transphobia or gender-based violence. This is not to endorse a ‘hierarchy of oppressions,’ but rather to insist on a degree of conceptual integrity to the analysis of racism. If we are serious about addressing racism, we need to understand the way it works politically and structurally, not simply add it to a list of things we don’t like. At its heart racism involves institutionalised violence of the most egregious kind – genocide, enslavement and apartheid. It is deeply embedded in the history of Europe and North America. And it is very often something that states do. It cannot be ‘shaken off’ by people – or governments – blandly affirming their opposition to hate. This state response often sees the bundling of three elements which profess to represent ‘hate crime.’ First, we find the recording of incidents by the police framed as ‘hate crime.’ Confusingly, these may not involve a crime at all in any legal sense; it is simply a methodology by which police record incidentswhich are reported by or to them that are connected to ‘hate’ in some way. Second, we find the concept of ‘aggravated crime’ – the recognition that some forms of crime are made worse if they are motivated by racism (or homophobia or disablism or religious hatred). This aspect of aggravation is sometimes legislated as a ‘signal crime’ which defines the crime is more serious because of its societal impact. Third, cutting across these categories, we find the notion of ‘hate speech.’ In some discussions of human rights standards, ‘hate speech’ is defined narrowly as speech that constitutes incitement to hatred. At other times, however, the term ‘hate speech’ is used promiscuously to identify a whole set of speech acts that are regarded as offensive by someone, but which – once again – may or may not constitute crimes. Crucially, in terms of incitement to hatred, a hate speech act – just saying something offensive in public about a protected characteristic – is not sufficient to constitute a crime. The element of ‘stirring up’ hatred against a group has also to be present. So, this whole new paradigm of ‘hate crime’ is both confused and confusing. A series of ambiguities cuts across different constructions of ‘hate crime’ in different international, national and regional contexts: the definitions often contradict each other; the ‘protected characteristics’ vary hugely both across different jurisdictions and different elements of international law. (For example, gender-based violence is rarely constructed as ‘hate crime’ despite its intimate connection to misogyny). Finally, most bizarrely of all, it emerges that – post-Macpherson – many of the incidents addressed as ‘hate crime’ are not crimes at all. In this context it is useful to ask whether the well-meaning demands for the Irish state to ‘do something’ about ‘hate crime’ in the 26 counties have any strategic value in the struggle against racism. Where did ‘hate crime’ come from? The purpose of this new counterintelligence endeavour is to expose, disrupt, misdirect, discredit or otherwise neutralise the activities of black-nationalist, hate-type organisations and groupings, their leadership, spokesmen, membership and supporters. Prevent the rise of a ‘messiah’ who could unify and electrify the militant black nationalist movement. Malcolm X might have been such a ‘messiah’…. Martin Luther King, Stokely Carmichael, and Elijah Muhammed all aspire to this position…. King could be a very real contender for this position should he abandon his supposed ‘obedience’ to ‘white, liberal doctrines’ (nonviolence) and embrace black nationalism. Carmichael has the necessary charisma to be a real threat in this way. So, in the 1960s, as the state began to take a serious interest in ‘hate’, the haters were clearly identified, and they included Martin Luther King. His was apparently the ‘hate’ that most threatened the US State. You can still find this information on the FBI website, in the ‘FBI vault.’  Moreover, the contemporary FBI is at pains to emphasise that, ‘COINTELPRO was later rightfully criticized by Congress and the American people for abridging first amendment rights and for other reasons.’ It also subtly reframes its analysis of what it called ‘Black Nationalist Hate Groups’ as ‘Black extremist’. It retains the term, ‘White Hate Groups’ however, for White Nationalist groups – so you know who the really bad guys are now. We shouldn’t, however, give the state too much credit for coming clean on this history. This COINTELPRO programme remained in place until it was exposed in 1971 by the anti-war activist burglary of documents from an FBI office in Pennsylvania. COINTELPRO’s activities were subsequently investigated by the United States Senate ‘Church Committee’ in 1975. The committee declared COINTELPRO’s activities were illegal and contrary to the US Constitution. At this point the story should begin to hint at some of the complexities of this cocktail of ‘hate,’ ‘the state,’ and ‘crime.’ Quite apart from the formal criminality of the burglary, the direct action was hardly ‘constitutional.’ You might surmise that had Hoover got his hands on the activists first, they might well have been dismissed as a ‘hate group’ (or ‘communists’ or ‘terrorists’ or ‘un-American’) and the truth buried forever. When white terrorists bomb a black church and kill five black children, that is an act of individual racism, widely deplored by most segments of the society. But when in that same city – Birmingham, Alabama – five hundred black babies die each year because of the lack of power, food, shelter and medical facilities, and thousands more are destroyed and maimed physically, emotionally and intellectually because of conditions of poverty and discrimination in the black community, that is a function of institutional racism. In 1965, the FBI formally named the perpetrators of the Birmingham bombing cited in this definition. J. Edgar Hoover blocked prosecutions and refused to disclose evidence with prosecutors. In 1968, the FBI formally closed their investigation into the bombing without filing charges against any of the suspects, and the files were sealed on Hoover’s orders. There is perhaps no clearer example of the complex interplay of individual racism, institutional racism and the state. And whether Hoover was motivated by ‘hate’ or by a sense of duty really has little bearing on the outcome. Whatever happened to institutional racism? The world has changed enormously in the intervening 50 years but the currency of ‘institutional racism’ should remain clear – you can swap ‘Birmingham, Alabama’ for ‘Yemen’ or ‘Gaza’ or ‘Myanmar’ and make the same point about contemporary racism. Equally tellingly, you can look at African American experience in contemporary Birmingham, Alabama or, indeed, the experience of migrant communities in Birmingham, England and make exactly the same point. Institutional racism keeps up its remorseless logic across generations, across communities, across the world, reproducing inequality and entitlement, condemning communities of colour to underdevelopment and reproducing white privilege. The concept retains both its explanatory power and its revolutionary simplicity. There are two key lessons from this in terms of our discussion. First, this incisive theoretical understanding of the structural aspects of racism emerged – very directly – out of black struggle that was labelled as ‘hate’ by the contemporary US state. Second, the state that did this was a paradigmatic example of ‘institutional racism’. This general position obtains – racism institutionalised through the state is its most dangerous, egregious form of all. This was true historically across the colonial states of Europe; it was true in Nazi Germany and it was true in apartheid South Africa. It remains true of contemporary states across the world. We can emblemise this shift in the UK with the appearance of House of Commons Northern Ireland Affairs Committee report on The Challenge of Diversity: Hate Crime in Northern Ireland: Ninth Report of Session 2004–05. This report – engaging with Northern Ireland, the UK polity most obviously associated with inequality institutionalised across the state – could develop its whole analysis without any serious reference to Macpherson or Stephen Lawrence. It was as if the UK state’s own ‘blueprint for the eradication of racism from the criminal justice system’ had never existed. As so often, Northern Ireland was the testing ground – and swapping ‘hate crime’ for ‘institutional racism’ allowed the UK state to remove itself from the petard it was hoist upon with the Macpherson report. More generally, this approach to repudiating institutional racism took the ‘individual racism’ side of the Carmichael/Hamilton argument on an even stranger journey. Now states that showed little commitment to addressing the structural inequality framed so powerfully by ‘institutional racism,’ suddenly became very keen to line up against ‘hate.’ This is a general trend that extends well beyond race and racism, but one example of how this works politically will suffice. We all know about the ‘Charlie Hebdo’ attacks. This violence wasn’t hard to problematise – the murder of journalists, however provocative their work, cannot but raise profound questions of free speech; the racist murder of Jewish people cannot but raise profound questions of antisemitism. But the political response from the state was telling. As ordinary people mobilised against the attacks, the political elite of Europe (and beyond) found it necessary to position itself at the head of a march against hate. One observer characterised it as ‘a rogue’s gallery of political leaders.’  Organisers had tried to exclude Marine La Pen and the Front National, but President Hollande insisted that all French people could be there. (And, yes, then Taoiseach Enda Kenny was there too). The Prime Minister of Iceland was lambasted as the only western European head of government not to attend the march. Put simply, even when issues of race are not lost in the wider sweep of more general discussions of ‘hate’ and ‘hate crime,’ this approach does nothing to address the specificity of racist or sectarian violence in Northern Ireland. This hate crime regime presents a bizarre post-modern spectacle – by Kafka out of Orwell. Everybody – from the Sinn Féin/DUP (non)government to loyalist paramilitaries and the police – ‘unites against hate’ in the ‘hate capital of Europe’ and yet the state acknowledges that there is ‘no such thing as hate crime in Northern Ireland.’ Meanwhile, the relentless progression of racist and sectarian violence continues. As the Northern Ireland experience suggests, the notion of ‘hate crime’ often constitutes a lightning rod for public disquiet about different forms of violence. 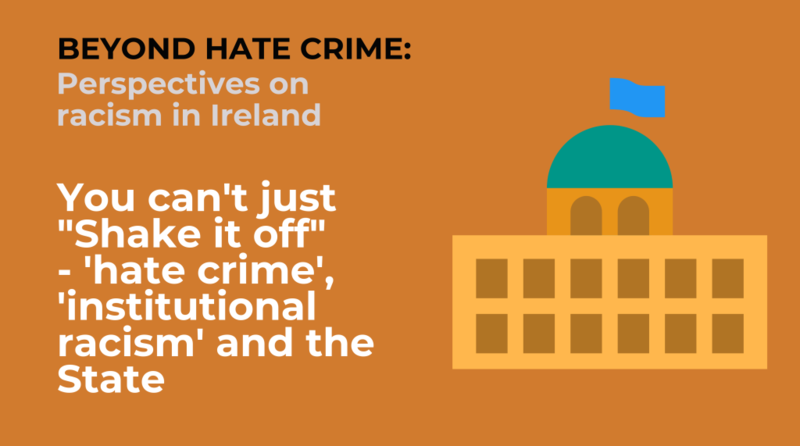 It also provides an easy way for the police and criminal justice system to be seen to be ‘doing something.’ But the growing demand for a similar intervention on ‘hate crime’ in the south of Ireland should carry a huge health warning. It is clear from our review that activity around ‘hate crime’ does as much to disguise racism as it does to address it. Moreover it is clear that states have cynically used the focus on hate crime to displace attention from institutional racism – not least because this concept addresses real structures of power and inequality rather than caricatures of ‘evil.’ Most cynically of all, the hate crime finesse allows the state to reinvent itself as anti-racist. This allows the state to join – and often lead - the coalition against ‘hate’. But it assumes this role without addressing any of the racism that continues to be institutionalised through the state – in the criminal justice system and the immigration system and the refugee system and in every other state institution. By way of conclusion, we can make a couple of simple observations. First, if the capacity to label ‘hate crime’ is surrendered to the state, it is as likely to be used against people of colour as it is in their defence. Second, if either Viktor Orban or Benjamin Netanyahu or the Saudi Ambassador is linking arms in solidarity with you against ‘hate,’ you are standing in the wrong place. 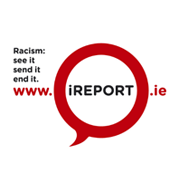 So, we need to think long and hard before we buy into the notion that the ‘hate crime’ paradigm offers any kind of a model for anti-racism in Ireland. For all that the state condemns ‘hate,’ it is rarely on the side of racial justice. Despite the admissions of ‘illegality’ and ‘unconstitutionality,’ the old COINTELPRO programme was reframed in the US. ‘Hate groups’ are back on the FBI agenda. And, yes, an awful lot of people would like to see Black Lives Matter added to the list…. Robbie McVeigh is an Irish writer and researcher based in Edinburgh. He is currently working on publication on Ireland and legacies of colonialism with Bill Rolston.